If you don't see the file, you can add it. 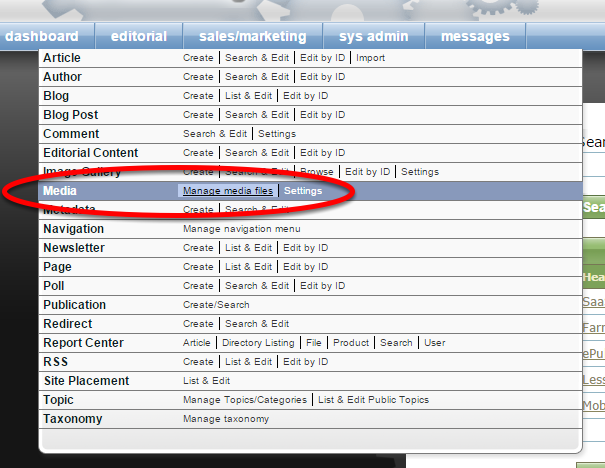 The site's templates will only use it if it exists in the Media Manager. NOTE: This is to be used by advanced users only. Changes made to this file can have dramatic impacts on your website. If you submit a support request to fix problems that stem from this file, any time researching and fixing the problem will be considered billable. 3.1. JQuery and other libraries? jQuery is already included in the core of the site, linking to another version will cause conflicts. 4. CAUTION: Changes should not modify the DOM or core templates. The contents of this file should not modify the DOM or core templates, other than Editorial Content Zones, or WYSIWYG controlled content. As core code is continuously updated over time, as a result any conflict that arises from this file will be considered billable. Prev: How do I update CSS styles on my website? Next: How do I create a newsletter sign-up form (manually)?